This morning I had a seizure I need!! Woo Hoo! Talked to my doctor & surgeon later in the day and was told… FRIDAY! They told me after the seizure that the surgery will be on Friday or Thursday. Seizure was successful as far as getting information and location from where it came from. 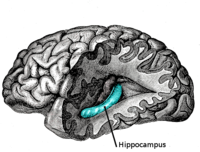 The Hippocampus of my brain is where this one is located at. Still would like to get more seizures before surgery, so I’m completely off my Depakote ER as of tonight. Love you!! Seize up Bud!! !